Google Maps Navigation, introduced today, puts the company in direct competition with GPS makers and former best friend, Apple. The service, which can nicely replace a standalone GPS, is only available for handsets running Google's Android operating system. Is an iPhone version in the works? Or, is Google really declaring war on its old partner? "Apple is a close partner, and millions of users experience Google Maps on the iPhone," said a Google spokesperson in an e-mailed statement. "We will continue to work with Apple to bring innovation, including Latitude and Navigation, to users, but you'll have to speak to Apple about availability. 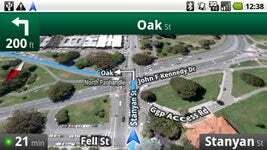 At one time, Google Maps Navigation would have surfaced first on Apple's iPhone. But, today's announcement of the service, which coincides with the formal announcement of Motorola's Droid handset, makes no mention of the iPhone. Does that sound like a marriage gone sour, or what? Google's other navigation app, a locator service called Latitude, is not available as an iPhone application and remains the subject of controversy as to who has kept it from being released, AT&T or Apple. Is Google saying Apple will have to accept Latitude to get the new navigation service? Could be. According to Google's official blog, the service includes all the features you'd expect in a high-end GPS for an automobile. These include turn-by-turn voice navigation, search bu voice, live traffic data, constantly updated maps, and searching along your route. Street view allows drivers to see an upcoming intersection, with the route overlaid onto it. At the end of the trip, a picture of the destination is also displayed. (Nice touch for the chronically lost). This is an excellent feature set and offers what a GPS user might want, minus a larger screen than most handsets offer. Garmin, Magellan, and Tomtom should be very afraid, indeed. There is one important downside, however: You need a data connection to use the service, making standalone devices or maps loaded onto the handset a better option for some users. While a handset may also be more difficult to use than a dedicated GPS (or not, it's open to debate), the price of Google's new service (free) is certainly right and saving the cost of a standalone GPS may pay for the handset. If you are going to have a smartphone anyway, why not use Google's Maps and save some money on a GPS? Yesterday, I wondered aloud how long it would be until iPhone users would need to make a decision betweens staying with Apple or moving to Android. I speculated that Google might release a "killer app" for Android that would not be available for iPhone. I didn't think I only had a day to wait. 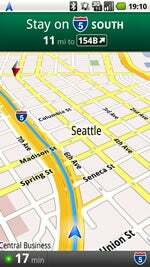 When you use Google Maps Navigation, your phone automatically gets the most up-to-date maps and business listings from Google Maps - you never need to buy map upgrades or update your device. And this data is continuously improving, thanks to users who report maps issues and businesses who activate their listings with Google Local Business Center.